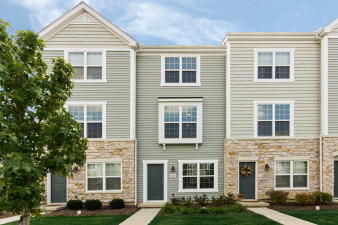 Incredibly stylish townhome in desirable Lofts at Haydens Crossing! OUTSTANDING kitchen features granite countertops with breakfast bar, matching island, stainless steel appliances, sharp back splash, and chic, quality cabinets that will never go out of style! Elegant vanities/faucets, each bedroom has a FULL bath! Relaxing balcony overlooks green space. This townhome has been meticulously maintained and needs absolutely nothing! Like new, move right in! Wonderful community includes clubhouse, ponds, an abundance of green space, and playground.